Promotion-chasing Wolves fell to just a second home defeat in the league this season as MK Dons boosted their stuttering play-off hopes. The visitors went ahead when Patrick Bamford finished well from a Samir Carruthers pass. Ben Reeves doubled the lead with a superbly struck effort from long range after half-time. Wolves sub Liam McAlinden fired across the face of goal but they were second best throughout. Defeat for the hosts means they drop one point behind leaders Leyton Orient and are now just three ahead of third-placed Brentford. Karl Robinson's side, who had not won in the league since 2 November, remain nine points outside the play-off places. "To come here and win 2-0, it's arguably one of the most perfect performances you'll see from any side here - I think it's one of the most perfect performances you'll see anywhere in the country. "It had everything I love about football, the passion, the desire, the quality, the ball rotation, and two wonderful sets of fans. We are very happy about how we have performed, and we've got to use this as a catalyst for the rest of our games. "Patrick [Bamford] has got so much support mechanism whether it's from Chelsea or MK Dons, but it's not about the support we that give him, it's how he takes that responsibility - and he took that on and put that into the game. That's why he's going to be such a quality player and a quality asset for Chelsea. "Now [the players] are back to where they belong. They're back to a group of people who know what it takes to win football matches". Match ends, Wolverhampton Wanderers 0, MK Dons 2. Second Half ends, Wolverhampton Wanderers 0, MK Dons 2. Substitution, MK Dons. Brendan Galloway replaces Ben Reeves. Alan Smith (MK Dons) wins a free kick on the left wing. Attempt missed. David Edwards (Wolverhampton Wanderers) right footed shot from outside the box misses to the right. Substitution, Wolverhampton Wanderers. Jake Cassidy replaces Kevin McDonald. Corner, Wolverhampton Wanderers. Conceded by Shaun Williams. Stephen Gleeson (MK Dons) wins a free kick on the left wing. Corner, MK Dons. Conceded by Carl Ikeme. Attempt saved. Stephen Gleeson (MK Dons) right footed shot from very close range is saved in the bottom right corner. Patrick Bamford (MK Dons) wins a free kick on the left wing. Attempt missed. David Edwards (Wolverhampton Wanderers) header from the centre of the box is close, but misses to the left. Kevin Doyle (Wolverhampton Wanderers) wins a free kick in the defensive half. Foul by Shaun Williams (MK Dons). Attempt missed. James Henry (Wolverhampton Wanderers) right footed shot from the right side of the box is high and wide to the right. Substitution, MK Dons. Alan Smith replaces Samir Carruthers. Corner, MK Dons. Conceded by Michael Jacobs. Foul by David Edwards (Wolverhampton Wanderers). Lee Hodson (MK Dons) wins a free kick on the left wing. Patrick Bamford (MK Dons) wins a free kick in the defensive half. Foul by Kevin Doyle (Wolverhampton Wanderers). Shaun Williams (MK Dons) wins a free kick in the attacking half. Attempt saved. David Edwards (Wolverhampton Wanderers) right footed shot from the centre of the box is saved in the bottom right corner. Attempt missed. 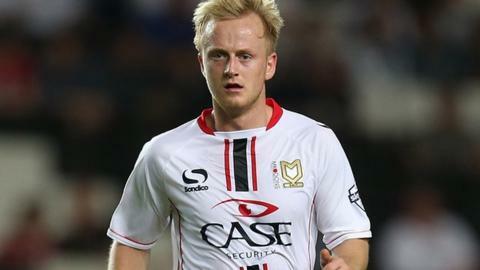 Darren Potter (MK Dons) right footed shot from long range on the right is close, but misses to the right from a direct free kick.